(detail) is an innovative exhibition that features the work of 118 international artists, each of whom have selected a close-up from one of their paintings. These details have been printed and are displayed together to give both a tantalising glimpse into the individual artworks and create a huge collage of images. (detail) responds to the unique setting of H Project Space, a traditionally constructed Thai house. 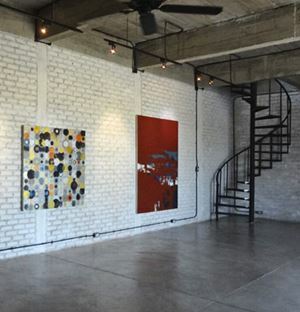 The artworks fit into the distinctive wooden framework of the walls and transform the space. Connections between the painting details have been consciously made by the curator as well as being formed serendipitously. Viewers are encouraged to create their own associations and interpretations of the juxtaposition of images. The show will be re-imagined as it moves from H-Project Space to the more conventional exhibition spaces of Transition Gallery, London and The Usher Gallery, Lincoln. (detail) features a wide range of painters, from the well-established to recent graduates. Their work encompasses abstraction, landscape, figuration and conceptually driven practices and employs a wide variety of mediums. Artists include: David Reed, Fiona Rae, Sigrid Holmwood, Stefan Sehler, Neal Rock, Shirley Kaneda, Pavel Buchler, Yelena Popova, Clem Crosby, Daniel Sturgis, Clyde Hopkins, Michael Fullerton, Gordon Cheung, Katie Pratt, Fabian Marcaccio, Jamie Shovlin, Sarah Pickstone, Dan Hays, Alexis Harding, Robert Holyhead, Mimei Thompson, Miho Sato and Andrew Stahl. A catalogue to accompany the exhibition will be published by Transition Editions to coincide with the exhibition’s launch at Transition Gallery on September 19, 2014. There (detail) runs to October 12, 2014 and will be mounted at The Usher Gallery from December 19, 2014 to April 19, 2015. Andrew Bracey (b. 1978) is an artist and curator, based in Lincolnshire, England. Solo exhibitions include Nottingham Castle (2014), Manchester Art Gallery (2009), Wolverhampton Art Gallery (2007) and firstsite, Colchester (2006). Recent group exhibitions include A Machine Aesthetic (2013/4), Gallery North, Newcastle and touring, The Ends of Art (2013), Beton7, Athens and Possession (I) (2013), BACC, Bangkok. Curated exhibitions include Misdirect Movies (2013), Royal Standard, Liverpool, and touring, Crocodiles With a Second Skin Thrash (2011) Over+Out, Lincoln, Unspooling: Artists & Cinema (2010), Cornerhouse, Manchester. He is Programme Leader of MA Fine Art and MA Contemporary Curatorial Practice at The University of Lincoln, England. The exhibition is supported by Arts Council England and The University of Lincoln, UK.